Today is a pretty big day for me. I am officially 22 years old. I’m like, a real adult now. It’s pretty crazy. While 21 was a big birthday, 22 is special in its own way. To celebrate this special day, I wanted to share some fun music facts about me with all of you. I am not a professional musician (yet), but I have always had music in my life. 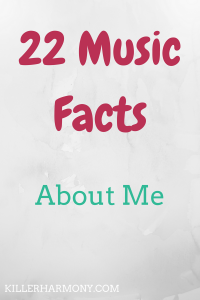 So, here are 22 music facts about me (with a bit of explanation for each). 1. I have played some sort of instrument since I was 6 years old. I have always loved music. Even though I didn’t stick with my first instrument (violin), my passion for music is very much alive. 2. I have played over 15 instruments. Piccolo, flute, alto flute, bass flute, soprano recorder, alto recorder, clarinet, alto saxophone, tenor saxophone, oboe, penny whistle, Native American flute, piano, ukulele, guitar, dulcimer, voice, and drums. 3. No one else in my family is a musician (except for my younger sister). One of my cousins played piano and sang for awhile, but he has gone on to other things. 4. I inherited two instruments from my grandmother. My family thought they would be of more use to me, the musician. I have a Native American flute and an Appalachian dulcimer. 5. My favorite type of music to listen to is pop. I am by no means a classical music snob. 6. My favorite type of music to play is Baroque. All of the music from that time is so intricate, and one of my favorite pieces to play is JS Bach’s Partita in A minor for solo flute. 7. I played flute, saxophone, and piano in a contemporary band in high school. My high school actually didn’t have the normal music curriculum. Instead, we had a contemporary band and a world percussion group. I played in the contemporary band, which was really fun. 8. With that band, I recorded some original music. I got to record a flute line to an original song that one of my band mates brought in one day. That was a really cool experience, especially because our band room was an actual recording studio! 9. I own over 15 different instruments. One piccolo, 3 flutes, 2 recorders, 2 penny whistles, a Native American flute, an electronic piano, a clarinet, 2 alto saxophones, a ukulele, a guitar, and a dulcimer. And, of course, my own voice. It’s great that you love music that much, but I think the only people that can say music is their life, are the people that actually make music. Sorry, not sorry. 11. I met and played for famous flutist Leone Buyse. For my first ever masterclass in college, I got to play a piece by Bach for Ms. Buyse. She is super nice, and I would love to study again with her one day. 12. I don’t get nervous before I perform. After performing so much, I have learned how to turn any nerves I do have into positive energy that helps my performance. 13. My first piccolo was an early birthday present that I found for a really good deal. I had wanted a piccolo for awhile and was in contact with someone who was looking to sell. I got a good enough deal that my parents bought it for me as an early birthday present. Three years later, I still play it! 14. I prefer playing flute without accompaniment. Since I had played piano for awhile, I was used to playing on my own. The first time I played with someone else was a little weird for me. I still enjoy playing unaccompanied pieces. I love them so much, 3 of my 7 senior recital works were just me. 15. The first flute I ever played belonged to my high school band director. I was at school one Saturday helping with set up for an event. The band room was open, and I stumbled upon the flute. I haven’t looked back since then. 16. My favorite composer is Claude Debussy. Syrinx is an amazing flute piece, and I love Debussy’s other works so much. His piano stuff is amazing, but I can’t quite play it. 17. I started this blog as a way to help other young musicians improve their craft. Blogging is tied with music for my biggest passion. I love being able to share tips and tricks with the world. It’s also fun to get to do personal posts like this once in awhile. 18. I see this blog as a way to grow my own skills and help me pursue music full time. The internet has made it more easy for musicians to make a name for themselves. I hope to be able to continue to share blog posts and even some recordings and videos of my playing here on this blog. 19. Classical music is very underrated, in my opinion. I think that everyone should give classical music a try. There is so much variety that there is something for everybody. 20. I first wanted to play flute when I was ten. Six years later, I finally got to. I remember asking my mom if I could play flute in the fifth grade band, but she said no. Jokes on us, cause twelve years later, I have a degree in flute performance! 21. Music theory was one of my favorite subjects in college. I have always been fascinated by music theory. It always comes easy to me, and I always enjoyed my theory classes. 22. I love sharing all of my musical knowledge and info on this blog and on social media. I don’t think traditional teaching will ever be for me, so I love being able to teach others through this blog. The internet has become an amazing resource for musicians of all levels, and I love adding to that! What fact or facts surprised you the most? Did you know any of these facts? Let me know in the comments! And, if you haven’t already, don’t forget to sign up for music tips in your inbox! Join the Killer Email Squad! Next Next post: What’s in My Flute Bag?